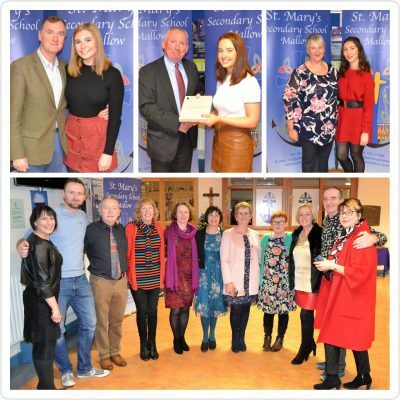 The Board of Management of St. Mary’s Secondary School, Mallow hosted a reception on the evening of Monday 3rd December for recent top performing Leaving Cert students, third-level scholarship recipients and retired members of the teaching staff. Students were accompanied by family members. Also in attendance were members of the current teaching staff, the Parents’ Association and the Student Council. Grace Moloney was the top performing Leaving Cert student and Katie Relihan was the top performing Leaving Cert Applied student in 2018. Grace Moloney and Kate Ivory have both been awarded a UCC Quercus Entrance Scholarship. Kate was also a recipient, along with Laura Long, of a JP McManus Scholarship. Lily O’Meara and Sinéad O’Riordan have both been awarded a UCD Entrance Scholarship. 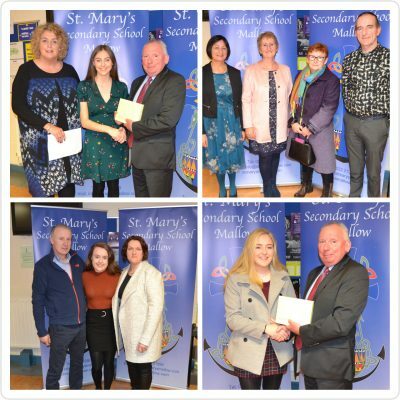 The recently retired members of the teaching staff who received presentations were Martin Timmons, Kathleen McGuane, Carmel O’Brien and Pauline Cudmore. Music for the reception was provided by Transition Year student Grainne Egan who played the piano and Second Year student Sophia Breen who played the concertina. John Hourihan, Chairperson of the Board of Management made a presentation to each of the students and retired teachers. Yvonne Bane, Principal congratulated the students on their achievements, thanked the retired teachers for their years of dedicated service and wished all every success and happiness in the future.